Adenosine deaminase (ADA) is a purine catabolic enzyme which irreversibly deaminates adenosine and deoxyadenosine. It is needed for the breakdown of adenosine from food and for the turnover of nucleic acids in tissues. ADA deficiency (due to mutations in the ADA gene) results in severe combined immunodeficiency (SCID) as a result of accumulation of deoxyadenosine which, in turn, leads to (1) a buildup of dATP which inhibits ribonucleotide reductase and prevents DNA synthesis; since developing T cells and B cells are some of the most mitotically active cells, they are highly susceptible to this condition, and (2) an increase in S- adenosylhomocysteine since ADA is important in the purine salvage pathway; both substances are toxic to immature lymphocytes, which thus fail to mature. Antigen: Native ADA purified from calf spleen and recombinant human ADA. Specificity: Native and recombinant ADA. ELISA: Recombinant human ADA coated on the solid phase at 0.5ug/ml. 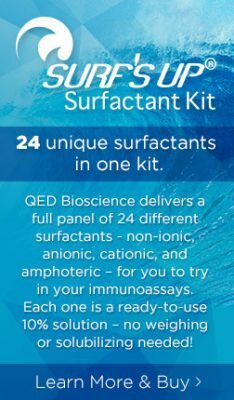 Immunoblotting: use at 200ng/ml. A band of ~38kDa is detected. These antibodies are stable for at least one (1) year at -20°C. Store in appropriate aliquots to avoid multiple freeze-thaw cycles.